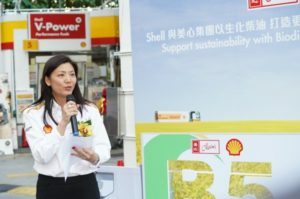 Shell announced on March 11 that it has launched its pilot program with Maxim’s Group to use Biodiesel from Maxim’s used cooking oil to power its fleet in Hong Kong. The first-of-its-kind program in Hong Kong will support over 100 delivery trucks, with annual consumption of 396,000 litres. Maxim’s Group is the first restaurant group in Hong Kong to join the program. Shell has been a pioneer provider of responsible energy solutions for corporations to contribute to Hong Kong’s sustainability since 2016. 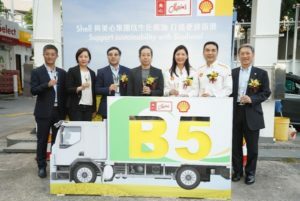 Shell is the first and only Biodiesel provider in Hong Kong through retail oil stations.This partnership has unlocked more benefits of bio-fuel, stepping towards a more sustainable energy mix. Shell has expanded the coverage of sustainable fuel to encourage Biodiesel adoption among commercial fleet customers. The three stations providing Biodiesel are located at Tsing Yi, Hong Kong International Airport and now Tai Po Market station. To produce Biodiesel, Shell sources biocomponents (B100) and blends them into diesel whilst managing the end-to-end quality assurance to get the high-quality fuel customers expect. This improves Hong Kong’s energy security, particularly when domestic raw materials are produced sustainably. The use of Biodiesel also lowers ‘well-to-wheel’ CO2 by providing a more sustainable alternative to conventional diesel. The fuel’s advanced formulation helps to reduce greenhouse gas emissions and advances towards the sustainability goals of commercial customers in the city. “Shell is one of the first to invest in advanced biofuels to explore new sustainable fuels that contribute to the energy mix of the future. We are pleased that Maxim’s Group believes in the value of sustainable fuel as we do and partnered with us to tackle the energy challenges together. We will continue to work with companies, customers and the society through different projects to make Hong Kong more sustainable.” Anne concluded.